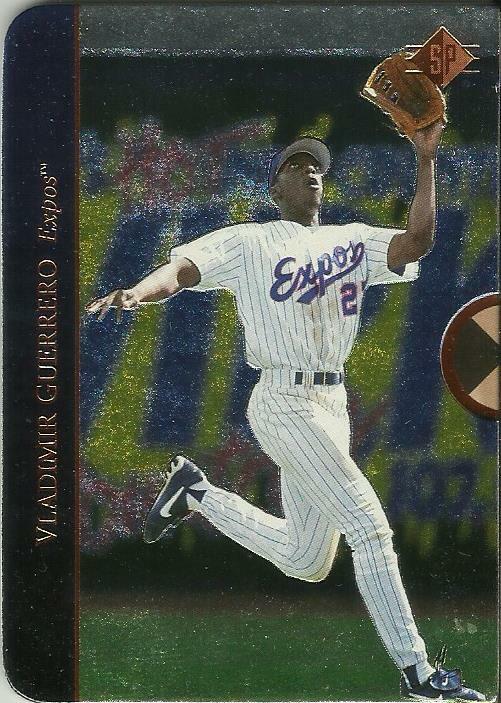 I started a new PC for Vladimir Guerrero. I already have many Angels cards of him as part of the team sets, but I decided I'd open it up, add him to the PCs, and start getting his "other team" cards (Expos, Rangers and Orioles). 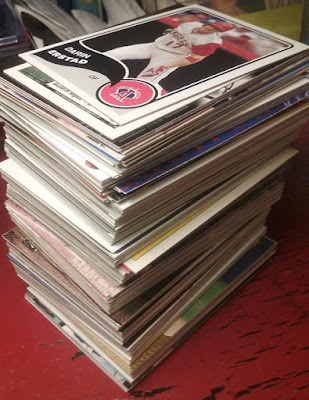 I've been picking them up slowly on Listia, I'm not a get-all-I-can-now, throw-a-hundred-bucks-at-sportlots and purchase-a-huge-bulk-of-cards-all-at-once kinda guy. 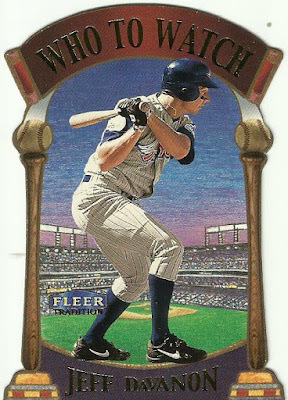 So this card I recently won on sportlots is one of the coolest cards I've ever seen, and I had never seen it before. So cool in fact that I decided to give it it's own post rather than wait and include it on the end-of-month Listia report post, like I usually do with my Listia winnings. 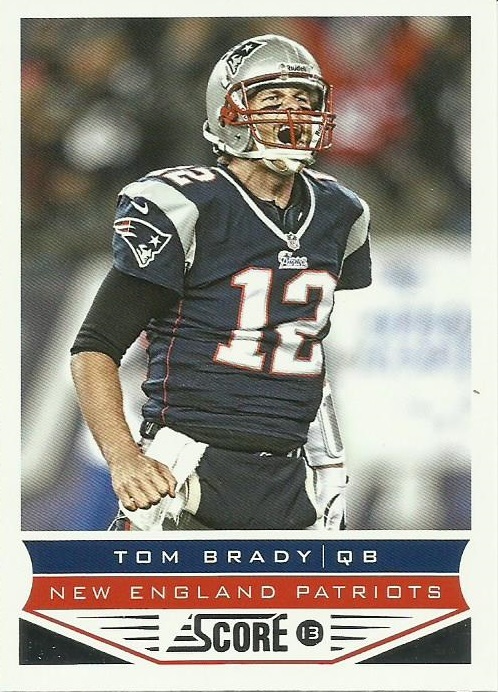 Lots of shiny foil caught my eye. 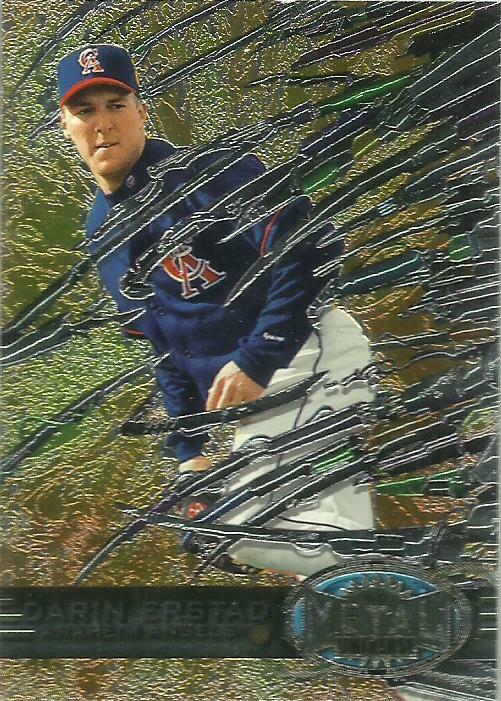 More shiny foil and great action shots. You grab the little notch with your thumb and pointer finger and pull out the info card! 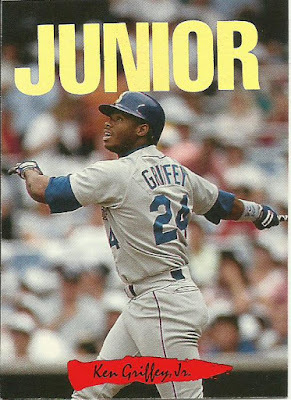 One of my favorite things as a kid, and still are now actually, are pop-up books. 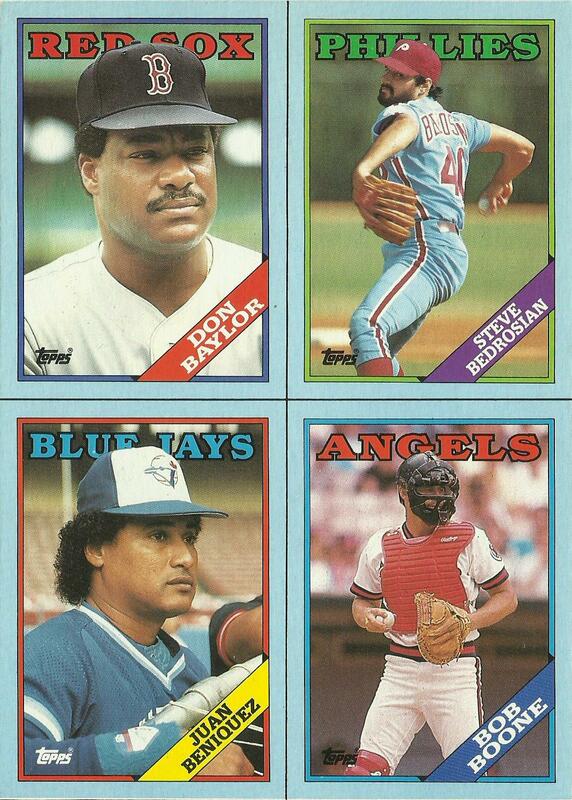 I especially liked the ones with a tab you would pull to make something move on the page. 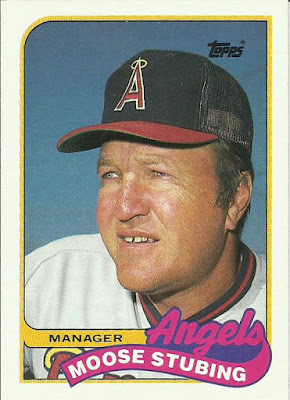 This card is right up that alley. 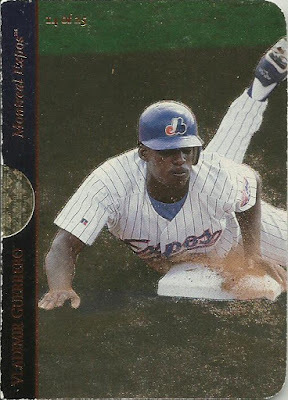 The card is little worn, but that's okay with me. This is the first time I've had one of these and I'm very happy to have it. First sent to John in 2005. 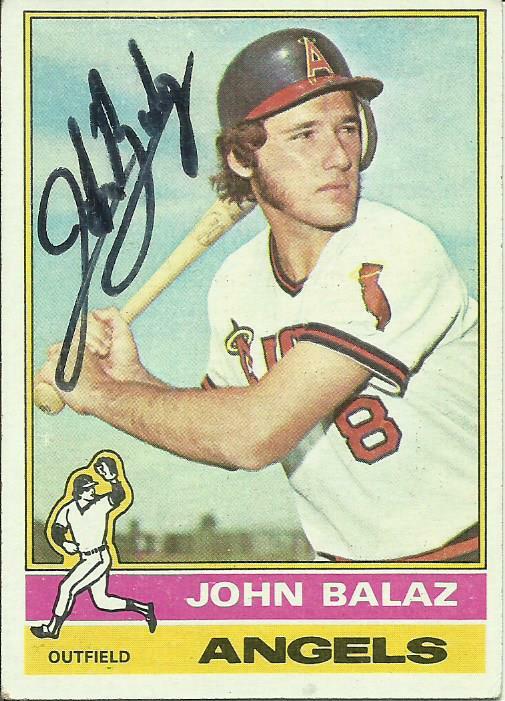 I didn't have this '76 Topps card at the time, but he signed 2 index cards for me. 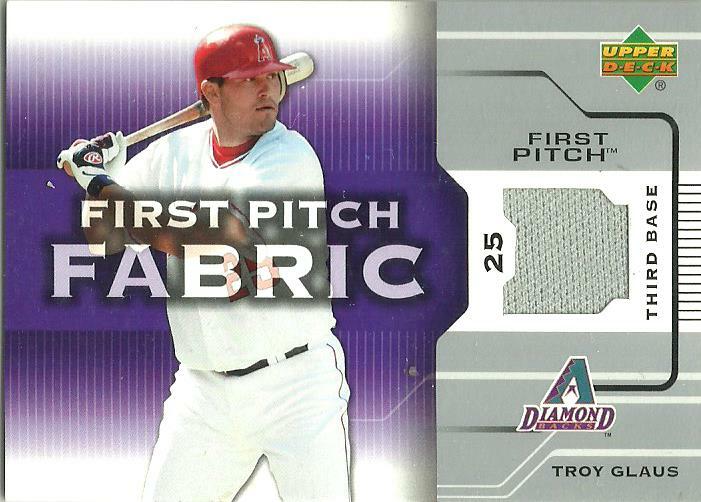 I sent to him again early last year, I had the card by now and decided to give it a try, but the envelope came back RTS. Drats! I reached out to a recent success on SCN and they gave me another address to use, with positive results. Got this back today, February 24, 2018 after 35 days, sent his home in San Diego. 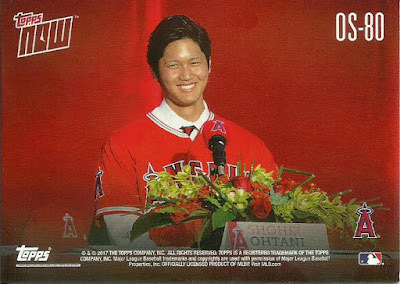 When the Angels won the Ohtani sweepstakes recently, I was stoked; a little reserved about the hype of his abilities, I’m giving it a wait and see, but stoked about the potential that’s there, and that he chose the Angels. With that came the realization that I’ll be needing his Angels cards for my team sets. 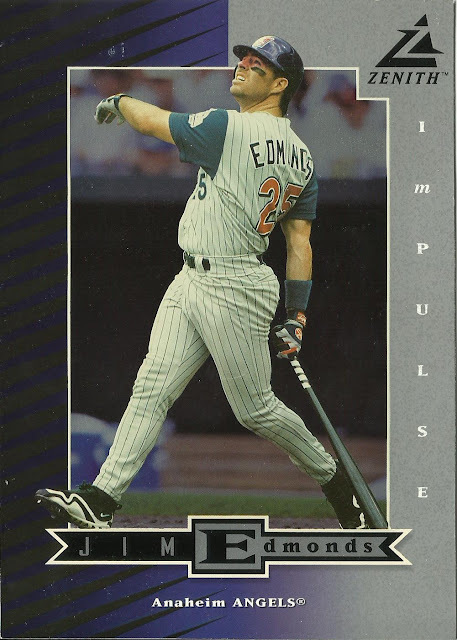 With his first year or MLB rookie cards a hot commodity, and probably next to impossible for me to obtain, let alone afford, I figured I’d have to wait a year, and maybe I’d get a second year card in a trade from a nice blogger. I don’t buy as much product as I used to so that will also decrease my chances of a good first-year or rookie card pull for the phenom. I remember when Mike Trout was coming up, all the hype about him and his potential, but I don’t recall Topps having an overly tight grip on his rookie card, or the public panic to clear the shelves of Topps product in search of them. 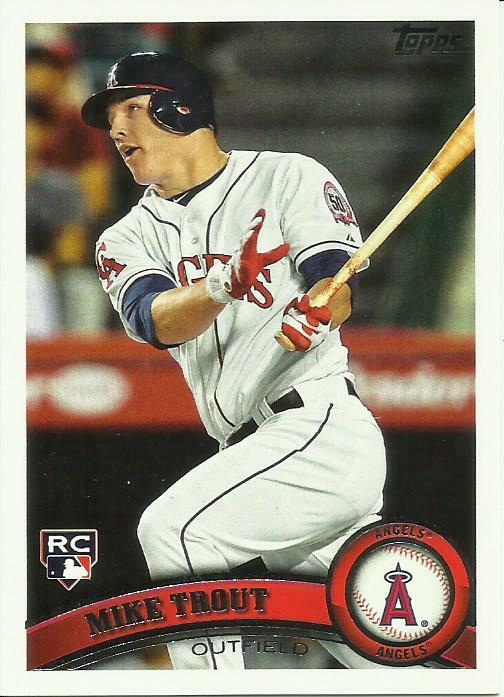 I might be mistaken, but I seem to recall readily available and abundant 2011 Topps Update rack packs, so much so that I was able to pull at least 5 Trout rookies out of the around 20-25 rack packs I purchased over the course of several weeks. 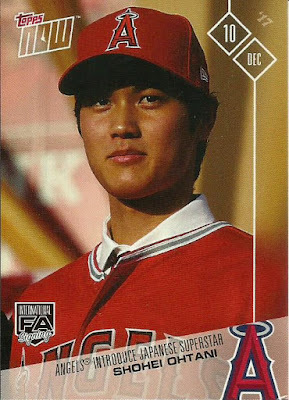 Another indicator Ohtani will be a hard pull is the way product including Aaron Judge's RC seemingly never even made it to the shelves around here, so I'm assuming there will no opportunity to pull Shotani cards. At least not this year. So all this has me thinking I might never have an Ohtani first year card. I had to email John and ask if this was maybe a mistake, if he accidently sent it to me. I don't know if this is considered a rookie card or not, but to me it doesn't matter. 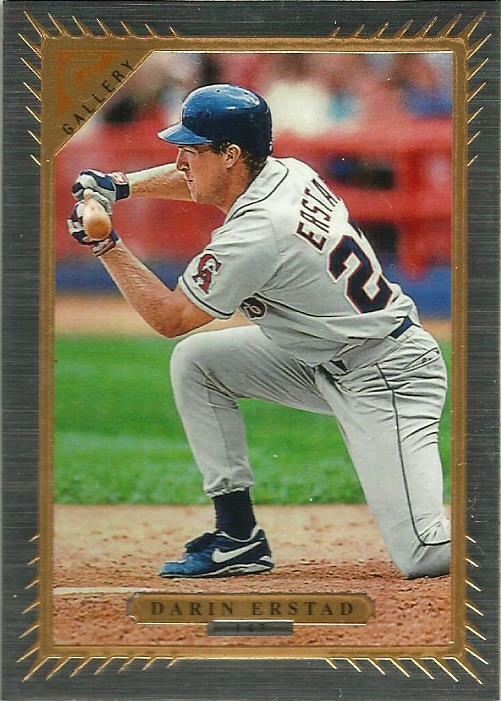 To me it represents a card that I thought I might never have. I honestly don't know much about Topps Now, but I do know that I don't have the budget for Topps Now. I'm just not sure about them, don't know what to think. 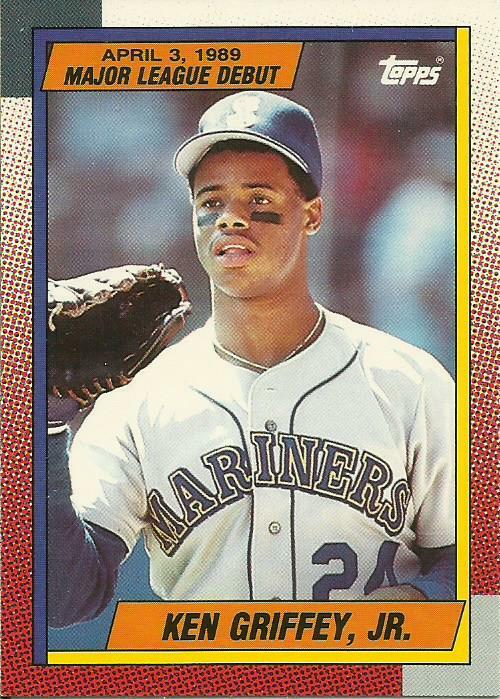 I'm old-school, you get the card you pull from the pack, you don't get to make them up as you go along. 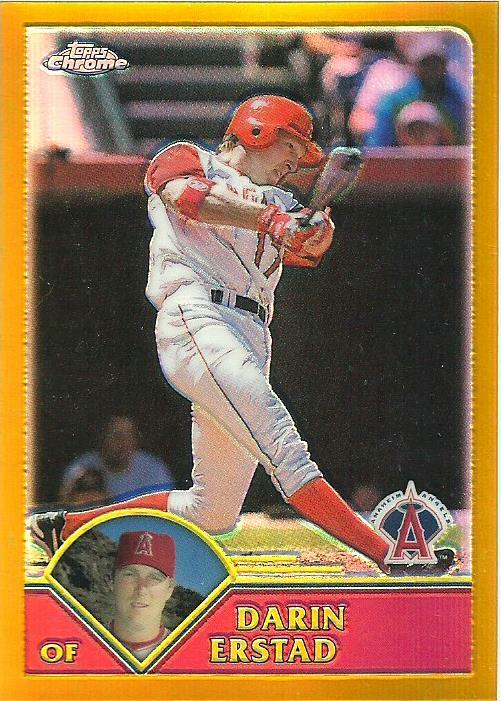 But now I'm beginning to see the niche for these, I'm beginning to kinda get it. 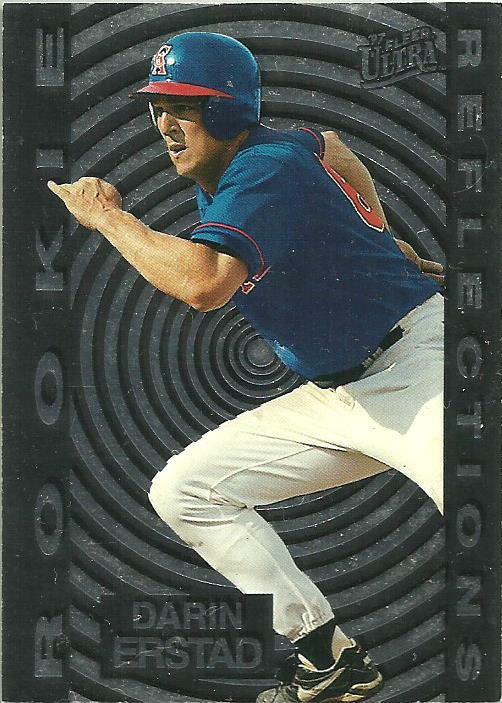 And this one is super cool. I'm stoked to have it. Lemme catch my breath now. 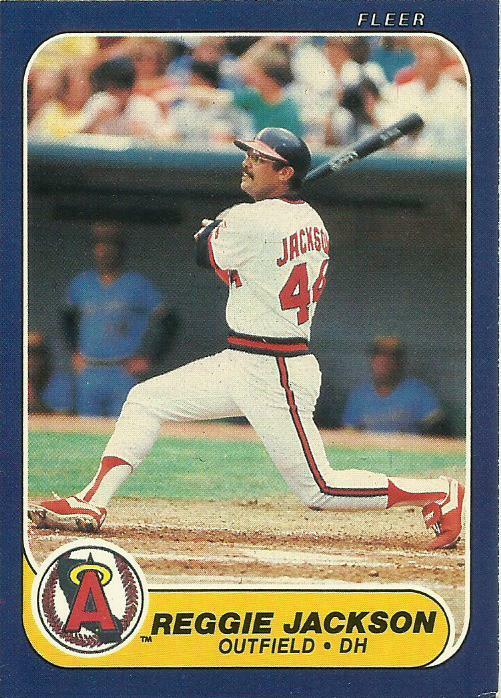 John sent a team bag full of other great Angels cards including just about every one of Reggie Jackson's. Love that follow through. A whole bunch of 2004 Cracker Jack, this sweet Tim Salmon Tattoo included. 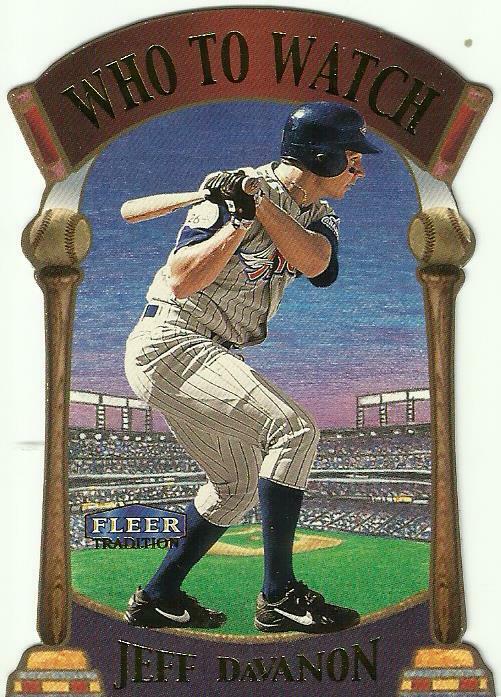 A classic 2000 Fleer Tradition die-cut card of Jeff Davanon. 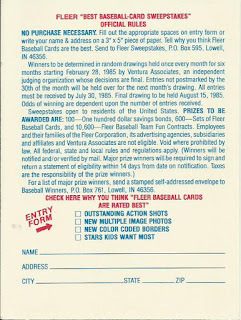 Great little 1985 Fleer sticker that also serves as a Sweepstakes card. Turns out he gets the nod for card #444 in the 1989 Topps Baseball set. 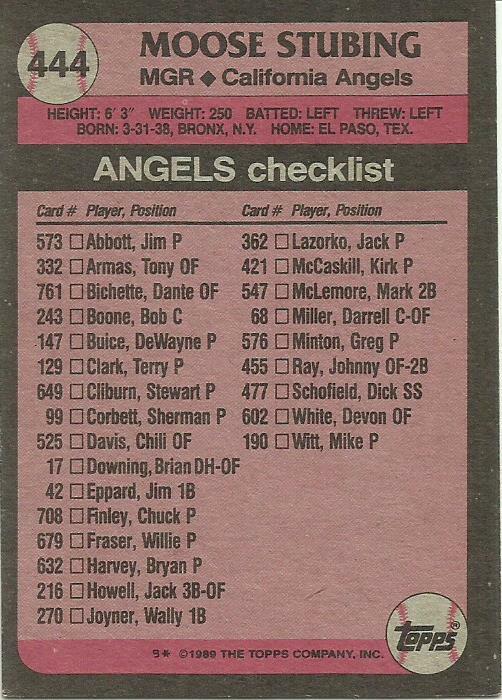 Upper left hand corner #444 on this Angels team checklist card. I think that this is the first team checklist card numbered 444 that I've come across. 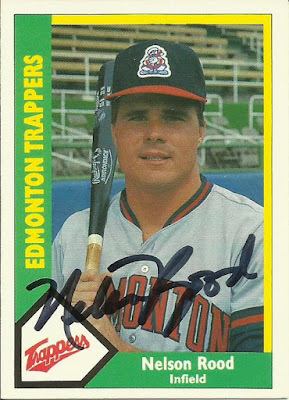 Interesting that this Moose Stubing card isn't listed on the team checklist. Goes without saying I guess. Now up to 64 different Baseball Cards Numbered 444. 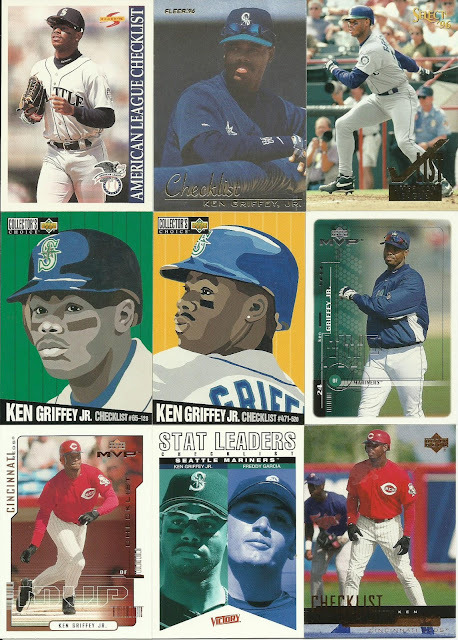 What's That Griffey Box Doing In This Angels House!? I'll tell you what it's doing in this house. 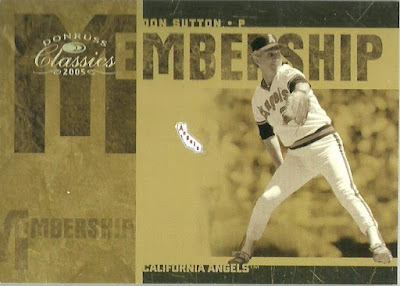 I accepted the Griffey box into this Angels home because I hoped that there would be some checklist cards in it. I figured by about 1993 Griffey was probably superstar enough to start showing up on checklist cards, and that the best place to pull some would be in the legendary Griffey Box. So I volunteered to be next on the list. And then I promptly forgot it was coming. 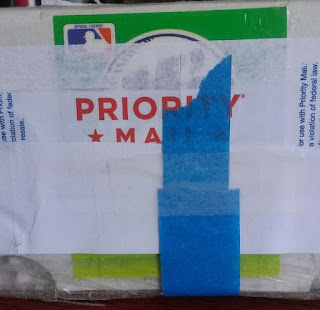 I was surprised to get a hefty Priority Mail box in the mail from Johnny's Trading Spot, thinking that I had no heads up for this, and no trade had been worked out (and seriously this was probably less that 2 weeks after I had asked to be next for it). Inside there was another box. 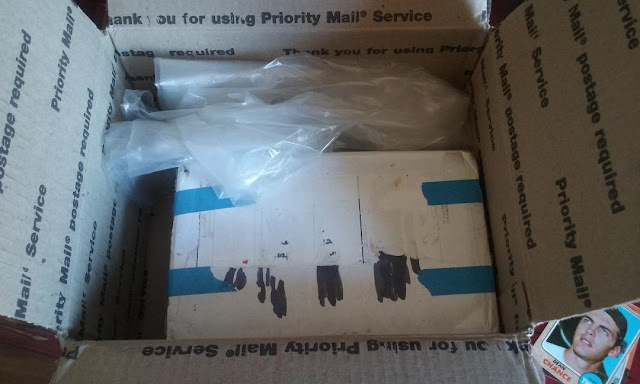 A cinder block of a box, all magled, dented, scribbled on and held together by the Top Three in Tapes: Masking, Packaging and Painters. 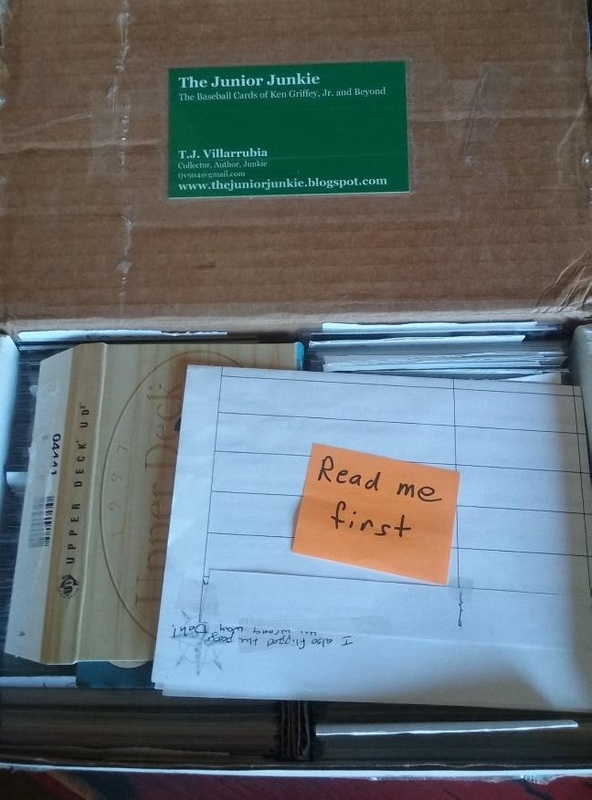 When I pulled the box out, my shock and disgust was audible. 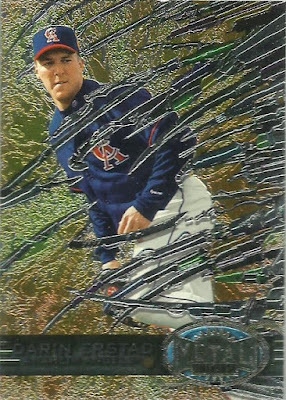 Who would dare abuse a Fleer sticker in such a manner? Not only did they actually USE the sticker, that's bad enough, but someone taped OVER most of it with at least two of the three Top Three in Tapes! 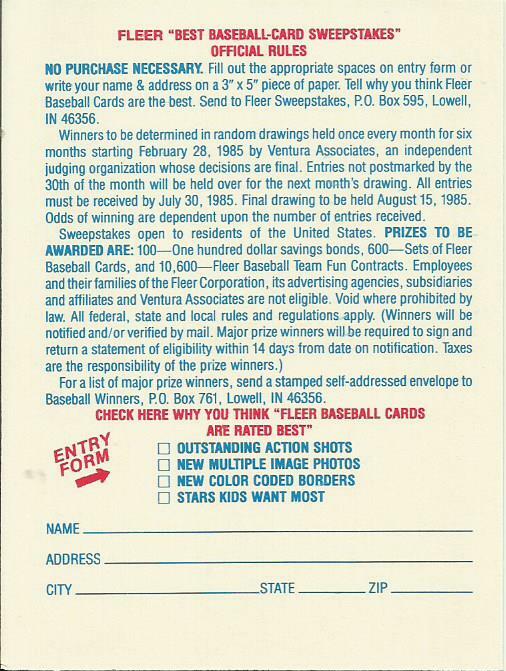 But then it occurred to me: Did John just send me a big fat cinder block of Fleer Stickers? OMG!!! I've died and gone to heaven! Opening it up I saw T.J.'s name and finally figured out what this was, and after calling myself a couple names, I dig in with excitement. 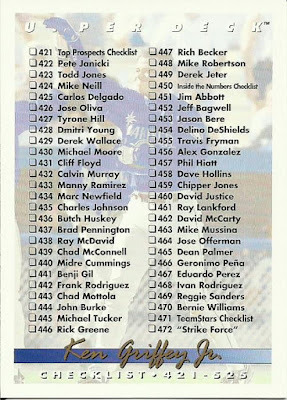 Pretty fun going through the 500+ cards in there. Like I said, checklists were my goal and thankfully checklists are what I found. 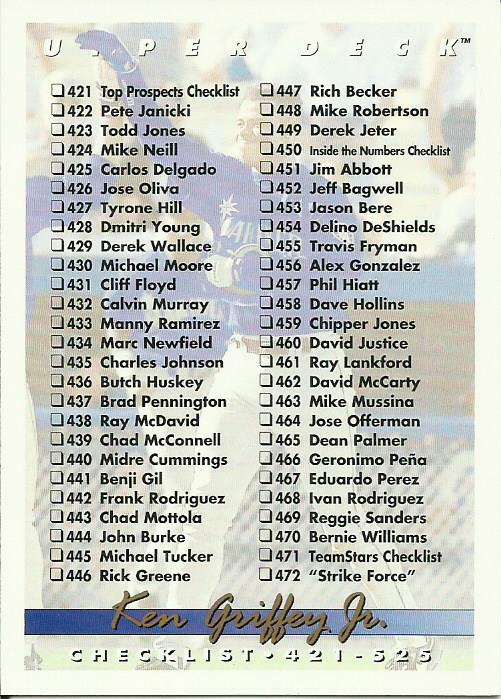 Traditional checklist with a ghosted background picture, very cool. 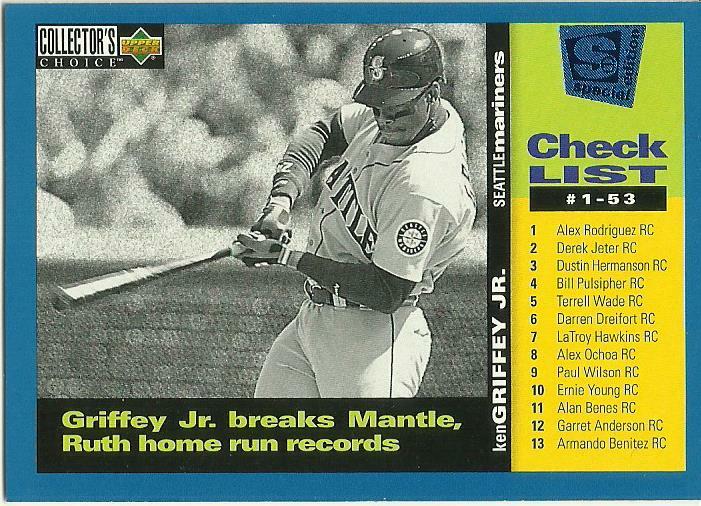 One of my favorite formats for checklist cards: half picture/half checklist and horizontal. 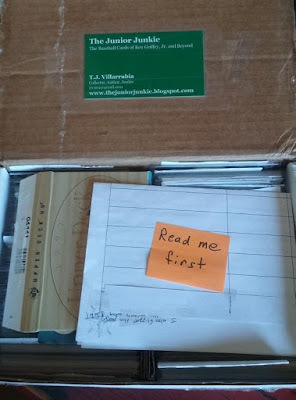 I made it a point to turn every card in the box over to check the back. 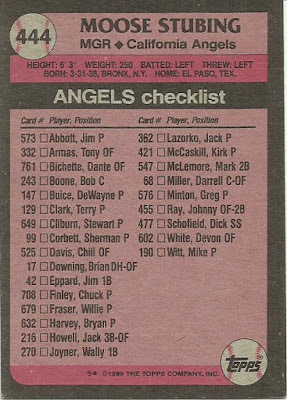 You wouldn't know these were checklists just by looking at the front. I loved it when Ultra when to the gold dusted backgrounds for the Gold Medallion editions. I pulled a few non-checklist Griffeys just because I liked them. I have a small stack of Griffey I keep, but by no means do I have a Griffey PC. Needed for the set build, even though I originally wasn't going to include these inserts with the set. 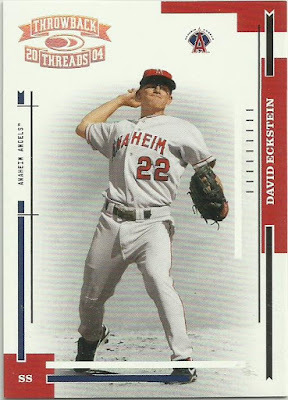 Seeing this card changed my mind. 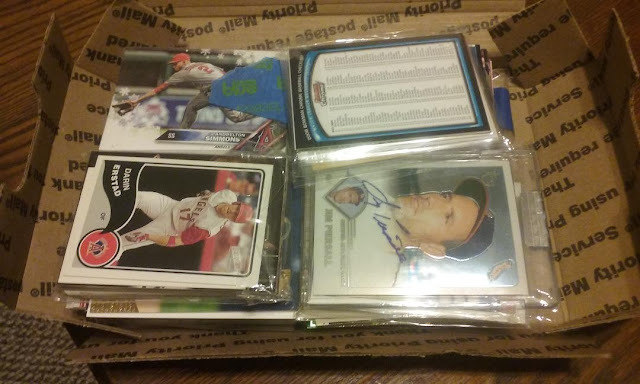 I got the box from Johnnys Trading Spot who had pulled a whopping 156 cards out of it. 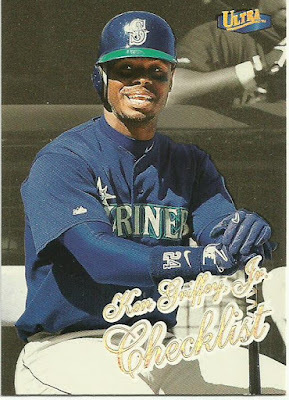 Fortunately he only pulled 5 or so checklists, and 4 of those were dupes of what I pulled above. Phew! I pulled 19 (and replaced at least that many), which is way more than I actually expected to pull, so I'm very pleased. I already have someone waiting for the box, so it's off to the PO! Drafted by the Astros in the 13th round of the 1983 amateur draft and spent most of his eight year minor league career in AAA. He was picked up by the Angels organization in 1990, his final season of baseball, appearing in 18 games. He managed the AZL Giants in 1991. He is now Director of Operations for Hangar 5 Productions. Nelson signed this card, and very thoughtfully answered questions sent to his home in Scottsdale, AZ returning them in 377 days. Super nice guy, he even apologised for taking so long to respond. A while back ARPSmith's put a call out for team collectors to claim their team because he had a ton of stock to trade out. I claimed the Angels of course and shortly thereafter received a Priority mailer literally bulging with Angels cards. Probably about 8 team bags stuffed full. Unfortunately I forgot to take a picture of it before I tore in. 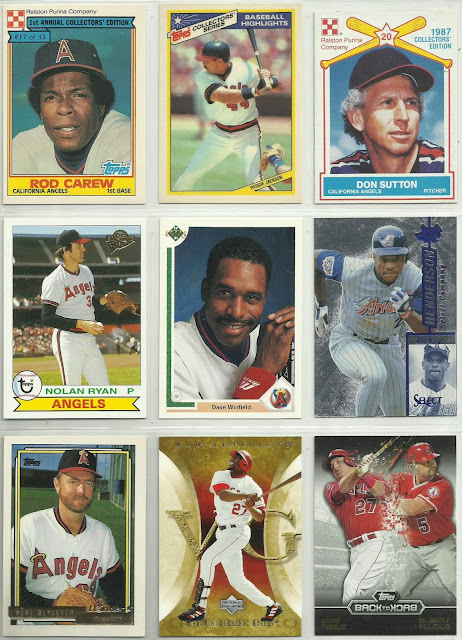 I finally wised up a while back and bought 2-pocket pages to store these large cards. I had been just piling them in to sheet protectors. Another large card for the 2-pocket pages! This is great because it will replace the gently used version I currently have. And it is expertly trimmed. Boone was the only Angels player in this box bottom set. Last card I needed for this special Tim Salmon ROY 4-card set. 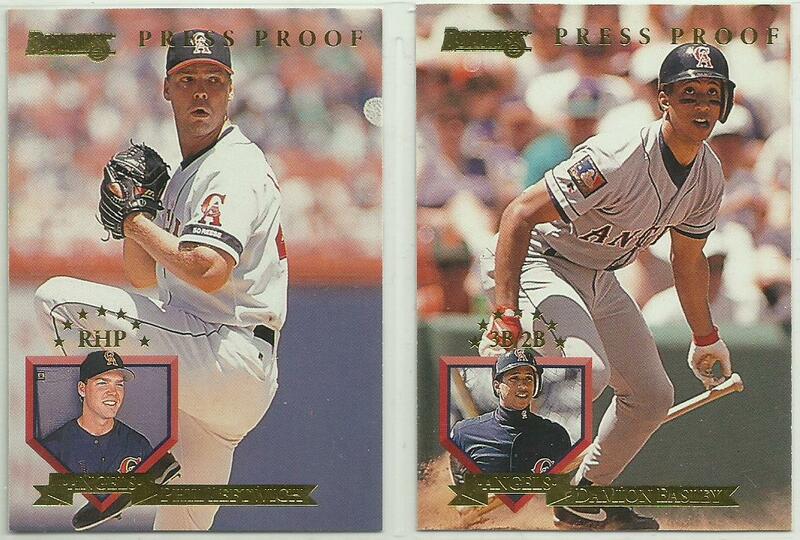 Gold foil instead of silver, and "PRESS PROOF" stamped on front, these were inserted just 1 in every 20 packs. 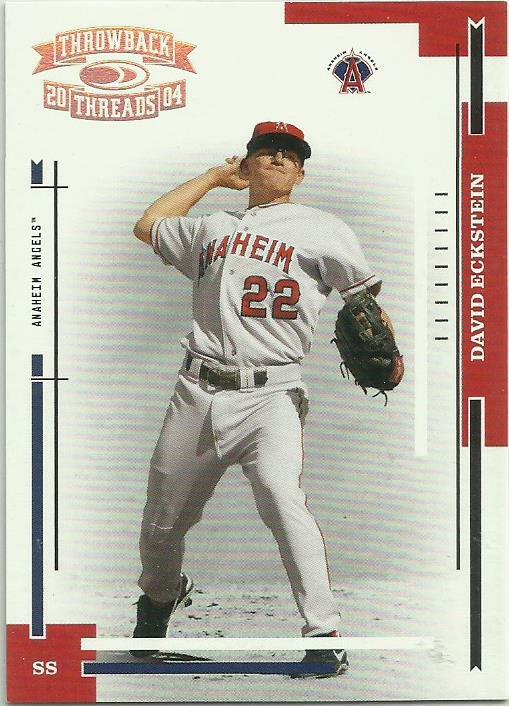 The back says "1st 2,000 Printed"
Other than a 1/1, does anyone actually have the final numbered card of numbered series like 499/499? That would be cool to have. 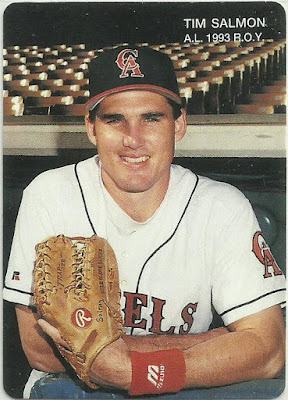 I started seeing a trend in that bulging box of Angels cards, like how many HOFers once played for the Angels (and how many future HOFers still are). 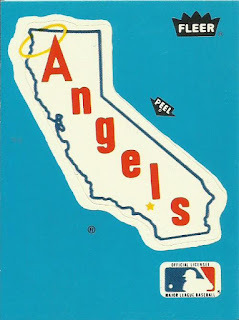 No picture to prove it, but again, that box was a bulging heap of Angels cards. 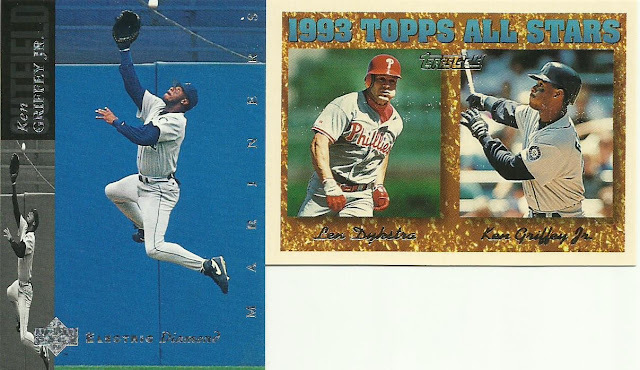 Back in January, Gavin posted a crap load of cards he hauled in from a card show that were available for trade. I picked out a few, Gavin mentioned he'd throw in some more Angels as well, and shortly after that the package arrived. Wow, that's much more than I expected. You can see the Piersall card I had picked out from his card show haul. Super Sweet! 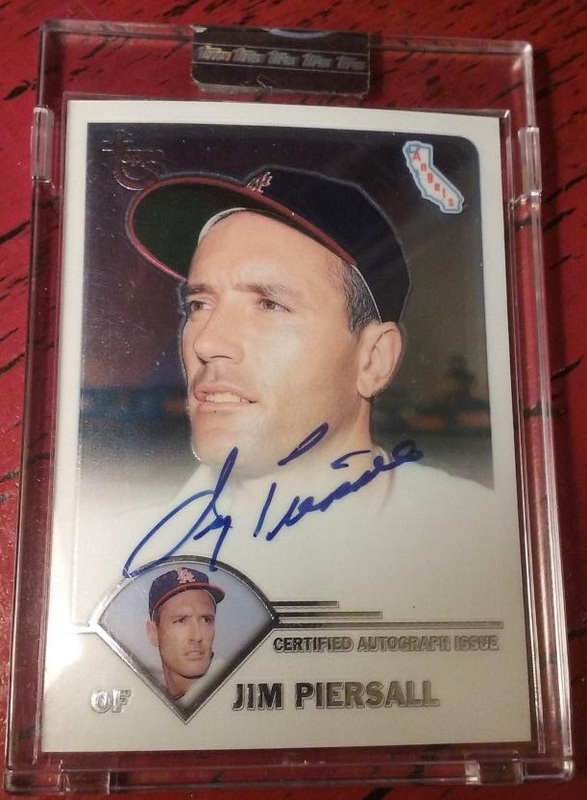 This is my first uncirculated autograph and I have to say that it's pretty cool sitting in that heavy, sealed slab. 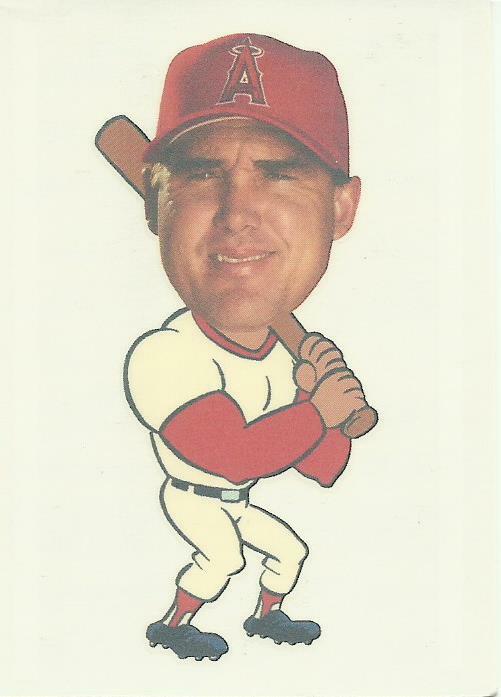 The only other uncirculated autograph in the set, for the Angels, is Jim Abbott's card. I'll have to seriously consider that. 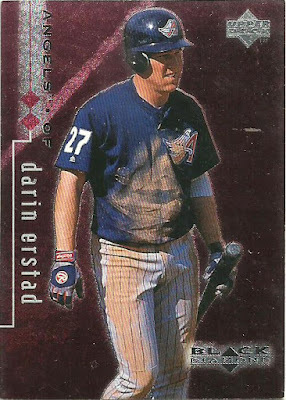 As I soon found out, the bulk of the other Angels cards in the box were all of Darin Erstad. 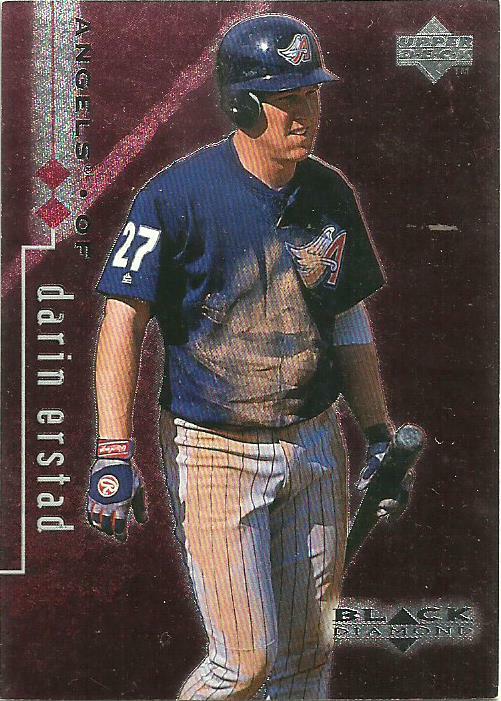 Unfortunately I didn't count them before I sorted them but there's like at least 200 different Erstad's in there. And surprisingly I needed almost all of them. 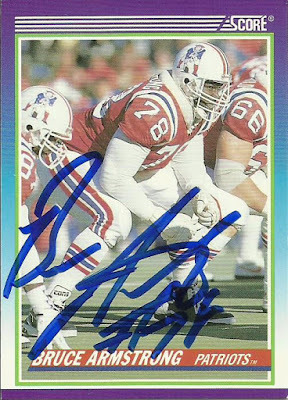 It's weird but he was the one guy my team sets were severely lacking. I picked out some to show. Even though this is a Diamondbacks card, Glaus is shown in an Angels uniform, and I have to assume that the fabric is from an Angels jersey; therefore, he's a keeper. 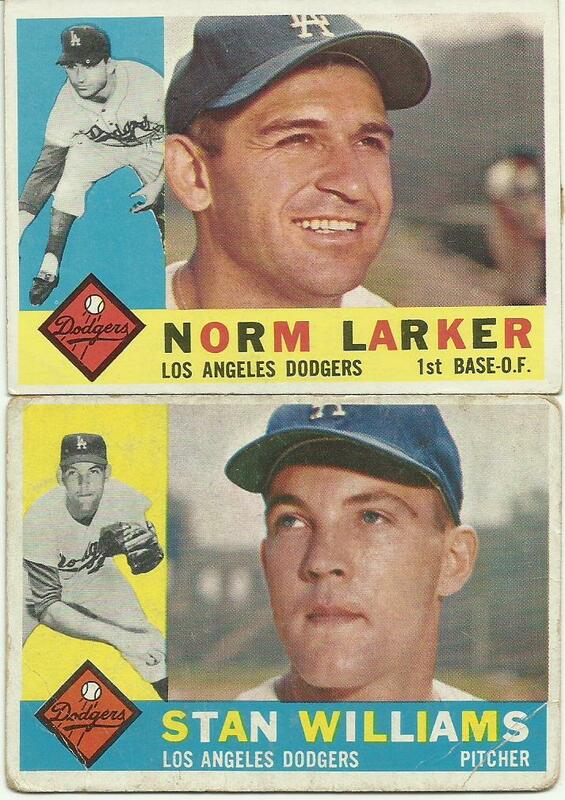 The only team set I'm collecting other than Angels, is the 1960 Topps (and 1954 Bowman) sets for the Dodgers. 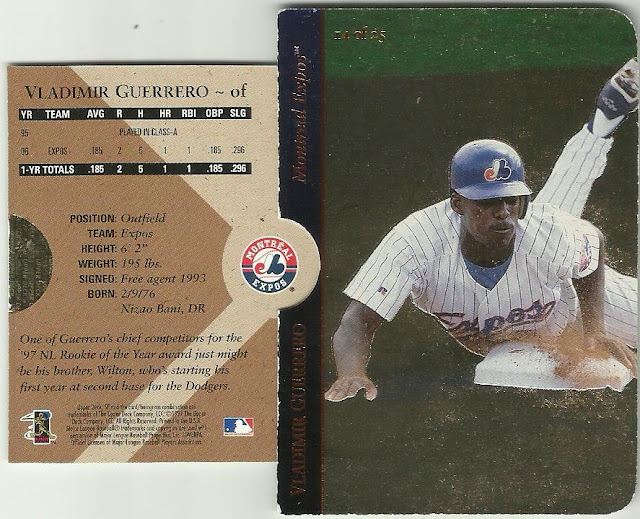 I was recently considering abandoning the 1960 effort, but when I saw these two cards available I was reinvigorated to continue on trying to complete the team set. 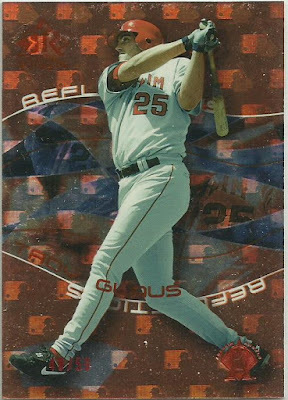 In an effort to make the large team set easier to accomplish however, I decided that I will not include the World Series cards as part of the team set. There's just too many of them. Gavin included these really nice customs as well. I had to go the baseball-reference to make sure that Vladdy had actually played on the Blue Jays. 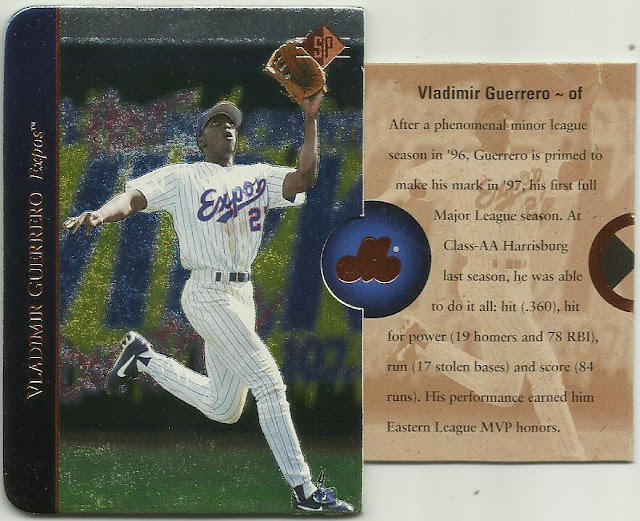 "During 2012, Vlad hit .358 while in the Blue Jays minor league system." 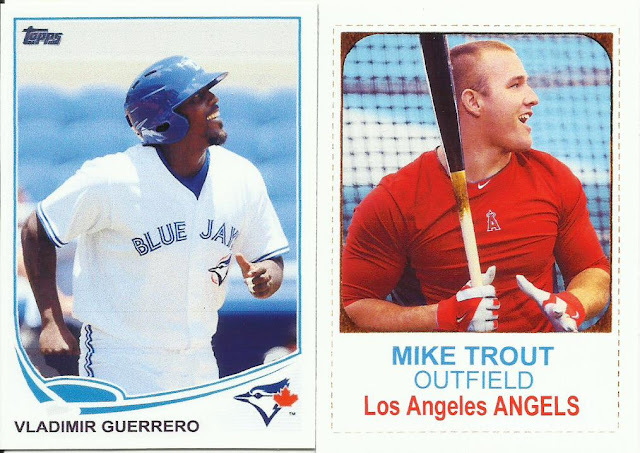 Always read the back of the card first kiddos! 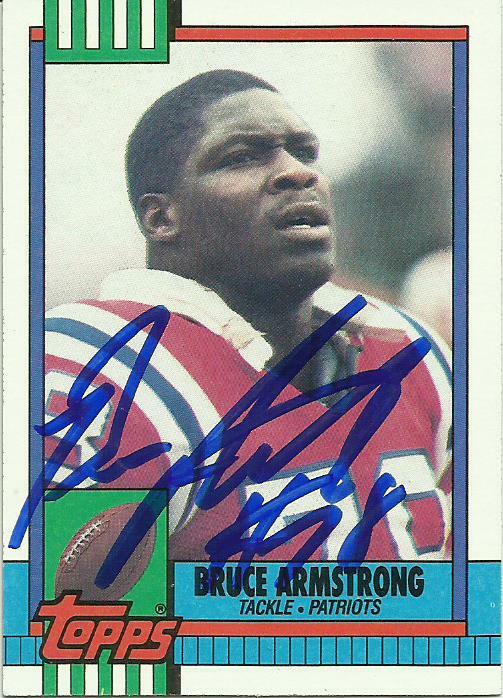 Received Patriot Great Bruce Armstrong return in the mail today saving me from the doldrums after that crappy loss last night. 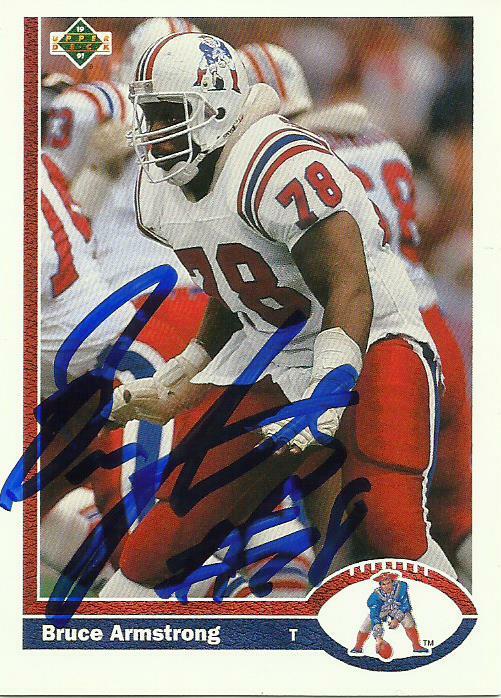 Got these back today, February 5th, after 9 days, sent to his Davie, Florida home. You all know what that means!